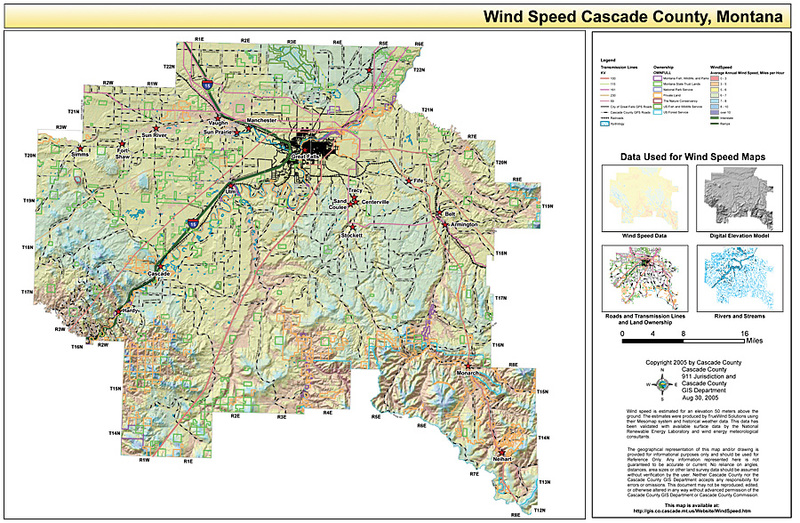 ArcGIS Desktop is used to create a wind map book combining wind, transmission, parcel, and road data. GIS data helps investors and developers locate best wind power resource areas. The county can visualize wind speeds and transmission lines with the functionality in ArcGIS. Cascade County, Montana, has its county seat in Great Falls and lies in an area on the eastern slope of the Rocky Mountains known for its powerful chinook winds. Cascade County commissioner Peggy Beltrone has coined the area south of the Canadian border the Don Quixote Canyon after the fictional character who had notable encounters with windmills. Beltrone, who also serves on the Department of Energy (DOE) Wind Powering America steering committee, has been the force behind a unique wind marketing program for the county that is receiving attention around the globe. 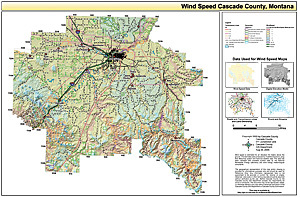 A wind speed map created with GIS. "There is a tremendous wind resource in Montana," Beltrone says, "but wind is generic, and the way to differentiate the wind that crosses through your county and the next county is to draw attention to it and make it easier for developers to explore your wind resource and see its value over wind in other areas." Cascade County is using GIS to help developers interested in investing in wind power easily research parcels available for lease and the wind resources that exist on those parcels. In addition to regional developers, interest has come from business people as far away as Japan and Ireland internationally and Florida in the United States. "We have a lot of people coming into our office looking for data on wind," notes Tom Mital, GIS manager for Cascade County. To better serve these interested parties, Mital used his county's ArcGIS Desktop software to create a wind map book that combines wind, transmission, parcel, and road data. The wind speed estimates for an elevation of 50 meters above the ground were produced by TrueWind Solutions LLC (Albany, New York) using its Mesomap system and historical weather data. The data was then validated with surface data from the National Renewable Energy Laboratory and wind energy meteorological consultants. 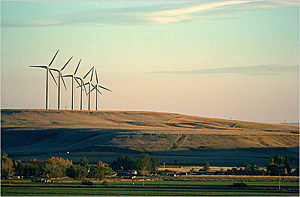 Horseshoe Bend Wind Farm in Cascade County, Montana (source: John Godwin). A PDF version of the map book is available on the Cascade County GIS Department Web page at www.co.cascade.mt.us. The Web page also includes links to a Wind Power Map and Wind Speed Map that visitors can download in PDF format. When someone requires more detail about a specific area, Mital creates a custom map. ArcGIS allows the county to show developers wind speeds across the county and locations of transmission lines. "Along with that, we have data such as topography, so it's very easy for someone to see that a wind farm would not be on the top of a pristine mountain," Beltrone notes. "This saves developers from having to fly in and be on the ground to see these things for themselves, and it saves them from having to go to the courthouse to search for landownership documents. Instead, they can access all of this information in one place on a computer anywhere in the world." Once a developer leases property from a landowner, typically a farmer, the investor installs a commercial-grade anemometer to measure the wind speed at 50 meters. Measurements are taken for approximately 18 months to verify the wind speed before installing wind turbines and connecting to a transmission line. "The nation is thirsty for wind power," Beltrone says. "Today, wind power supplies 1 percent of the nation's electricity. Under a plan by DOE's Wind Powering America, that number could climb to 20 percent by 2030." In Cascade County, anemometers are showing up on land throughout the area, and there is currently one wind farm, Horseshoe Bend, that has six wind turbines producing nine megawatts of energy. In addition to the positive environmental impact of generating green energy, wind farms allow the county to expand its tax base. During the first year of taxation, Beltrone estimates that each commercial wind turbine brings $25,000 into the community. 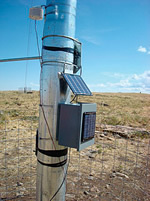 Wind data from sensors on this rural anemometer is sent to remote computers for analysis. For the investors, the wind farms generate revenue when they sell the energy the turbines generate. Additionally, investing in green energy helps states meet renewable energy portfolio standards. Twenty-nine states have adopted renewable energy portfolio standards. "The advantage of using GIS in the marketing of wind is that it gives developers a lot of information that they need to decide whether or not placing a wind turbine in this area is going to work for their power needs and their budgets," Beltrone adds. "One executive told me that the information we provided saved his staff months of work, since we did all the work for them. If he can take a look at our resources without having to invest time and money in preliminary research, it's a big draw." For more information, contact commissioner Peggy Beltrone, Cascade County, Montana (e-mail: pbeltrone@co.cascade.mt.us).